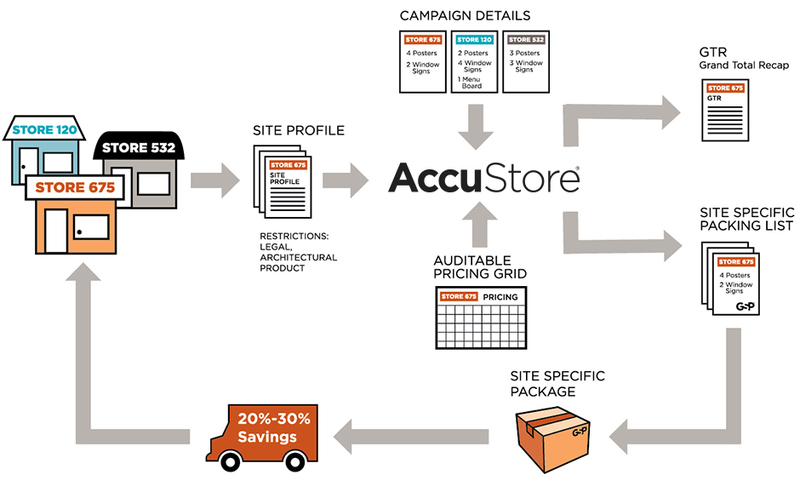 AccuStore®, GSP’s proprietary store intelligence software, offers store-specific fulfillment technology that manages all aspects of your POP campaigns from production to inventory management to maximize the return on your in-store marketing efforts. It houses and provides web-based access to your store profiles and filters the site-specific data to determine the precise POP needs for each store. This ensures your stores only get what they need and nothing more. It also gives you the ability to generate invoices for all POP orders. Easily audit invoices by comparing them to approved orders for complete billing transparency. Use AccuStore’s store-specific distribution list creator to generate a grand total recap report listing each sign element in order with a unique ID. Sort according to racking order for 100% accuracy rate. With web-based access to store profiles, you can determine the distribution of each individual order. Only stores that meet the criteria will receive those specific signs. Store-specific, barcoded packing slips detail each individual store’s required package contents to create a site-specific kit with no overage. Access your printing orders anytime. You can generate reports and invoices for all orders to easily audit and compare them to what you’ve approved.